Your browser does not support HTML5 audio. If you’d like to listen to the file, use the download link below. 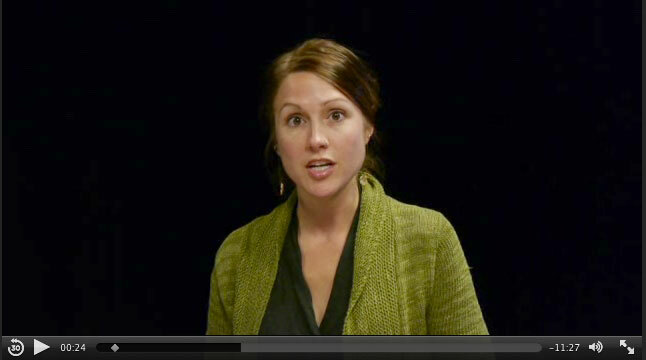 Deepen interaction: Enable online collaboration to deepen classroom interactions. Increase time efficiency: Demonstrate key concepts or foundational material online to make better use of class time. Offer flexibility: On-demand review learning when they enter the classroom. Enable review and repetition: Use online modules to cover complex topics for students to access on demand. One common challenge associated with this model of blended learning is avoiding the “course and a half” dilemma. Because seat time is not reduced and online components are added, the amount of additional material can significantly add to the overall workload for students. Consider the UW-Madison “Flexible Physics in the Google World” project as an example of a supplemental approach. The project involved developing short and informative videos to help orient students to lab scenarios and more quickly get them started exploring concepts. View the sample video below and find more information at the flexible physics at UW-Madison website. 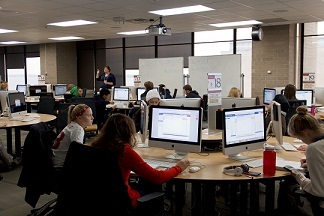 We have many examples of emporium spaces at UW-Madison, such as various active learning classrooms around campus and especially the WisCEL spaces in College Library and Wendt Commons. At L&S Learning Support Services, we’ve had the opportunity to support a blended learning course that employs the replacement mode. Social Work 644, taught by professor Don Anderson, originated as a “tele-course” that featured video recorded lectures were recorded and broadcast via Wisconsin Public Television. As the course evolved, the video lecture component was moved online. Now, students have an organized three-module progression that consists of numerous online activities and lecture videos that feature Professor Anderson and experts in various social work specialties relevant to the course. Because of the well developed online content and interactive learning activities, seat time is reduced to four times each semester (one orientation session and three discussion sections that correspond to each of the three modules). Because the online content is well developed, it is also used to offer continuing education for social work professionals throughout the state. It also serves as a helpful resource to a public facing audience as the lectures are useful to families who care for loved ones with a developmental disability. View their public website. Though these three models above are the most common models of blended learning in higher education, there exists a spectrum of blended learning models (some of which are more often used in K-12 environments). 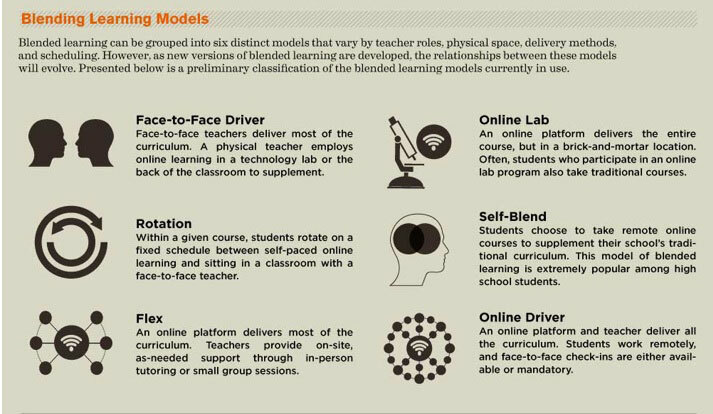 Take a look at the graphic below that describes the blended learning model spectrum. You’ll notice that a few of these models overlap with one or more of the supplemental, emporium, or replacement models. The flipped classroom model is somewhat well known and often interchangeably used with blended learning, though it does not quite employ the same pedagogical approach as other blended learning models. For this reason, the flipped classroom is generally considered to be a step toward blended learning but not a true blended learning model. A flipped classroom can be somewhat narrowly characterized as course delivery approach that simply reverses the lecture and home paradigm – lectures are recorded and delivered online and homework is done during the regular class meeting time. While the flipped model significantly changes the way an instructor manages the course, the model might not fundamentally change the pedagogical approach of the course and engage with some of the key blended learning concepts (such as reduction in seat time, active student learning, and efficient use of in-class and online time). That said, there are still benefits and opportunities for the students with the flipped classroom. First, the active portion of their learning is done in close proximity to the instructor during the in-class session. Second, the lecture recordings can be available on demand and can be played and replayed to help absorb complex topics or review in advance of an assessment. Finally, the approach opens possibilities for peer-to-peer learning and collaboration among students to help build a vibrant learning community. Developing a flipped classroom module can also help instructor move toward creating a more fully realized blended learning environment. The hyflex model is popular in K-12 education and is a hybrid of many of the other blended learning models. Effectively, the hyflex model is a “blended” blended learning model, meaning that the students can choose their method of delivery (in-class or online) for various activities and course content and have multiple modes of delivery to choose from per course module/assignment/activity.